Ursa Major and Cassiopeia (a.k.a. The “W”) belong to a group of constellations called circumpolar. If you were to watch them for 24 hours you’d see them both revolve around Polaris, the North Star, while staying opposite each other all the way. Polaris would remain motionless, a behavior much appreciated by navigators. Also useful for navigation is the fact: elevation of Polaris = your latitude. 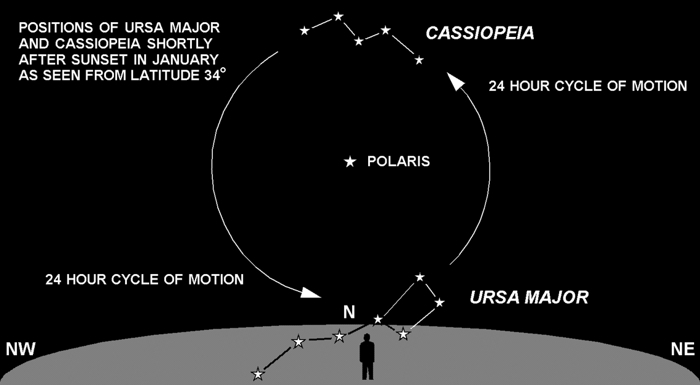 At the latitude of New River, AZ (34°), Ursa Major dips just below the horizon once every 24-hour cycle of motion. It’s only partly visible and very low in the sky. This is the scenario just after sunset in January, but if you really want to see the Dipper, wait for a few hours and it will eventually rise. By July, six months later, this cycle will be shifted by 180°. Cassiopeia is at the bottom and the Dipper at the top. If you go outside at sunset and look for the Dipper in July, you’ll see it high up and prominent in the sky. This is why the Dipper is often referred to as a Summer constellation.